What causes inflation? Most people believe inflation is caused by central banks adjusting monetary conditions... But is this right? A recent study by some top economists has raised questions about this conventional wisdom. The study found that the standard indicators... [like] economic slack, inflation expectations, and money growth were, in fact, unrelated to inflation. These findings caused quite a stir and even led the Wall Street Journal to declare that “everything markets think they know about inflation might be wrong”. While the USMPF report is titled Deflating Inflation Expectations, we do not conclude that expectations are unimportant. In fact, quite the opposite: the failure of measured inflation expectations to help forecast changes in inflation is probably a side effect of monetary policy’s success in stabilizing them. Imagine that the Fed is a driver, the economy is a car, the gas pedal is monetary policy and the car's speed is the inflation rate. The Fed’s objective here is to keep the car moving steadily along at 65 miles per hour. When the car starts climbing hills, the Fed pushes further down on the gas pedal. When the car starts descending from the hills, the Fed lays off the gas pedal. Over many hills and miles, the Fed is able to maintain 65 MPH by making these adjustments to the gas pedal. A child sitting in the backseat of the car who was oblivious to the hills but saw the many changes to the gas pedal would probably conclude the gas pedal has no bearing on the speed of the car. After all, no matter what happened to the gas pedal the car’s speed never changed. As outside observers, we know better. We know the driver was adjusting the gas pedal just enough to offset the ups and downs of the hills so that a constant speed was maintained. In terms of our Fed analogy, monetary policy was adjusted just enough to offset the ups and downs of the economy so that a stable inflation rate was maintained. So many people have failed to grasp this point, especially over the past eight years. The Fed got the inflation it wanted over this period by pushing the gas pedal--QE and low rates--just enough to offset the drag of the Great Recession on the price level. Although the Fed wanted a quick recovery, it wanted even more to maintain stable and low inflation. This is evident in their core inflation projections in the FOMC's Summary of Economic Projections (which always saw 2% as ceiling) and in the FOMC's revealed preferences. This meant the FOMC was not willing to allow an inflation overshoot which, in addition to making their inflation target symmetric, would have allowed more rapid catch-up growth in aggregate demand. As I have said elsewhere, this was the Fed's Dirty Little Secret: its policies were never going to create a robust recovery given the Fed's asymmetric approach to inflation targeting. But I digress, the point of this post is to remind us that analyzing monetary policy is hard. One cannot simply draw conclusions by looking at interest rates, output gaps, money growth and comparing them to inflation Depending on how the Fed is conducting monetary policy, these indicators should be uncorrelated with inflation if the Fed is doing its job. Given the importance of this idea, I have excerpted an earlier post on this topic below the fold. Nick Rowe reminds us that if a central bank is doing a good job in terms of hitting its nominal target, then both the indicator variables and the monetary policy instrument it uses should not be correlated with the target. For example, say the central bank were targeting a nominal GDP growth of about 5% a year and adjusted the stance of monetary policy to offset velocity shocks so that the 5% target was hit on average. Though the stance of monetary policy would be systematically related to the velocity shocks it would not be correlated with nominal GDP growth. An observer, not knowing any better, might study the empirical relationship between the stance of monetary policy and nominal GDP growth and conclude monetary policy is ineffective with regards to nominal spending when in fact it is very effective. Just looking at these two figures could lead one to conclude monetary policy became less important over time. Some observers, however, argue that during the latter period monetary policy did a better job responding to economic shocks and thus, helped paved the way for the "Great Moderation" in economic activity. If so, it would make it difficult to find as strong a relationship between the Fed's operational instrument, the federal funds rate, and economic activity during the "Great Moderation" than before. This is the point Nick Rowe is making. It is also one that Jean Boivin and Marc P. Giannoni convincingly make in this influential paper (ungated version). Second, this line of reasoning also means that one cannot look at measures of money--monetary base, M1, M3, etc.--and conclude they are unimportant for monetary policy. Adam P. notes, for example, that with an inflation-targeting central bank a zero correlation between the monetary base and the inflation rate does not mean that the monetary base is inconsequential for inflation, but only that the central bank is doing its job well. Similarly, Nick Rowe explains elsewhere that if a central bank is successfully targeting a nominal GDP growth rate, then one should not expect to find a relationship between the money supply and nominal GDP growth. Again, this does not mean money is unimportant. What it does mean is that the central bank is managing to offset shocks to velocity and money supply such that nominal GDP growth is being stabilized. Josh Hendrickson makes a strong case that during the "Great Moderation" the Federal Reserve effectively was targeting nominal GDP growth of around 5%. If so, then the above reasoning implies that during this time there should be a strong negative relationship between the growth rates of the money supply (M) and velocity (V), but little if any relationship between that of the money supply and nominal GDP. 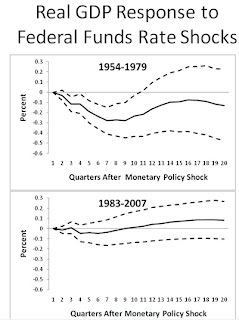 However, this should be less true prior to this time when the Fed was not stabilizing the nominal GDP growth rate--the period of the "Great Inflation"--and there really was no nominal anchor for U.S. monetary policy. The graphs below provide evidence on this claim. Similar evidence can be found using other monetary aggregates. 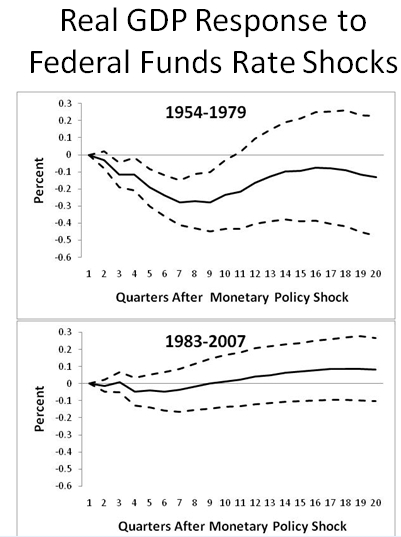 Now these graphs should not be interpreted as meaning the Fed should target a monetary aggregate. Rather, they should be viewed as evidence that it is difficult to assess the effectiveness of successful monetary policy by looking at indicator variables and policy instruments. What observers should be looking to is the central's bank's nominal target to see if it is being maintained on average. Ultimately, that is the best indication of monetary policy's effectiveness. Great post, Mr. David! Thank you!